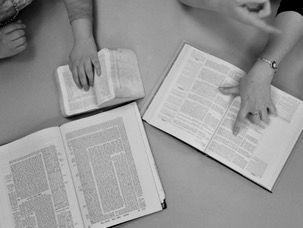 Three commentators examine a line from a story included in the Talmud about the unexpected outcomes of arguing. Is it really possible that two people could argue with heated vengeance and then part as lovers? How are we to understand this line? The talmudic principle that the premise of any and all arguments is l’shem sh’mayim, for the sake of heaven, offers some guidance. Although winning may appear to be the point of an argument, the higher purpose is to reveal a small facet of the mysteries of the Divine — to distill an idea so that it becomes a reflection of truth in the world. It is no wonder that our rabbinic sages could feel so impassioned about a point and, at the same time, be able to see the goodness in each other. They needed one another to get to the truth. This is no small task, and it requires both partners in learning to be dedicated as well as willing to forego their own agendas. So much more than opposition is the recognition that the very one who opposes you is really as vital as a lover. As with any intimate relationship, dispute can be the very mechanism by which we truly see each other panim el panim, face-to-face, with nothing left to hide. If only we felt safe enough to take such a risk. The grammatical puzzle of the plural is the ontological mystery of Torah learning — no act of transformative creation happens on its own. The Torah risks one of its foundational principles, the oneness of God, God’s very singularity, to emphasize this concept. How radical! Even God does not create alone! The medieval commentator Rashi claims that the “let Us” is a conversation between God and the angels; Nachmanides, the medieval scholar known as Ramban, argues that God is speaking to the dust of the earth. The midrashim are a cacophony of vengeful arguments — you’re going to create humankind? Are you mad? You’re going to fuse the Divine, the eternal, the sparks of holiness, with the mundane, the ephemeral, the dregs of the earth? Well, yes, “the very one who opposes you is really as vital as a lover.” And humankind was created through that love. It is unnatural to ever feel safe enough to take such a risk — to create together with those who are so different from us, so opposed, so opposite, that not only do we think differently and act differently from them but we are also actually vengeful toward them. And yet, the mold of creation has been formed. And it is highly unsafe. And — perhaps — it is the only path forward to create life, to create love. When we are involved in the words of Torah, when we put speech to Divine use, our words can melt or break down that which has been carved into stone. The process of learning Torah is a noisy one; students become heated and agitated. Just walk into any beit midrash and you will find the discussion deafening. But these heated arguments are vastly different from the shouting matches on the floor of Congress and the unruly debate formats that pass for discourse on television and public radio. When we sit involved in Divine dialogue, we are mutually uplifted. As civilization becomes more diverse and the likelihood of misunderstanding between neighbors increases, we need to understand the difference between shouting matches, which leave us feeling empty, and restorative ‘Torahdig’ dialogue, which allows us to part as lovers and friends. What enabled our sages to confront each other with serious matters and yet part as friends was the principle and practice of libun hilchasa, a talmudic term that refers to all law emerging from heated debate. I like to understand libun hilchasa as warmth generated through dialogue. Through this warmth, we can achieve mutual understanding that, in the words of Jeremiah, “melt stone.” And in so doing we part as dear friends, for we have fostered love through the warmth of dialogue. Arik Labowitz is a visiting spiritual leader for several Jewish communities on the West Coast and runs a thriving and independent bnai mitzvah program in Berkeley, Calif. He has recorded two albums of Jewish music and can be reached at ariklabowitz.com. Maya Bernstein co-directs the certificate in facilitation program at Georgetown University’s School of Continuing Studies and is on the faculty at Yeshivat Maharat and the Wexner Foundation. She is a co-founder of and associate at UpStart. Rabbi Marc Labowitz is a teacher, lecturer, and award-winning composer serving as the rabbi of Temple Adath Or in South Florida. He can be reached at rabbimarc@taocenter.net. He and Arik Labowitz are brothers.